Politicians like Sen. Lindsey Graham deny the existence of voter fraud, but in fact, numerous studies document the fraud these politicians and their media votaries consciously ignore or derisively rebut. A warm, sunny Saturday a decade ago, there was a Hispanic festival in our small town, a bedroom community for illegal aliens seeking day labor jobs in the nearby wealthy suburbs. It was a sanctuary city at the time. No problem with the festival itself. The music was lively and the food tasty. And don't the Irish have St. Patrick's Day, and the Italians Columbus Day? While wandering around the festivities, I noticed a table with three nice ladies in front of a "Register To Vote" sign. Curious about its presence at a festival where the bulk of the crowd was either illegal alien day laborers or legal non-citizens, I went over to inquire. Before I spoke, one of those nice ladies asked me if I was registered to vote. Wanting to see where this would go, I said no, and asked how to sign up. A voter registration form was thrust in my hands. The very first item on these forms, in Virginia and the rest of America, was "I am a citizen of the United States of America," with YES and NO blocks to check. "Don't I need to show you some proof of citizenship?" I asked. She replied "no." I asked her how she could verify that I wasn’t lying. Sensing she might be on a slippery slope, she called over a supervisor from the Registrar's Office and told the woman of my concern. The official told me they never checked citizenship status because I would be penalized if I lied. Really? So I asked her how she would verify my truthfulness, or those of the dozens of new voters being registered that day. Defensively, she replied that they checked all registrations for accuracy at the Registrar's Office when they were turned in. I called the Registrar Monday, and asked if they do indeed verify citizenship status. I was told that they didn't unless someone made a specific complaint against an individual applicant. The brutal truth is that illegal aliens vote, and in large numbers. Voter fraud is not exclusive to illegal aliens. There are also legal aliens (green card, H1B visas, tourist visa holders, etc.) who vote illegally. And it's not just Latin Americans. The non-citizen demographic includes South Asian tech workers, Irish overstays, West and Horn of Africa immigrants, and Asian students. Then there are dual-state voters (college kids, snowbirds, transients), reincarnated voters, and un-purged voters long moved from their precincts. While few cases are prosecuted, it’s not because few crimes are committed. Political pressure from Democrats and the cowardly establishment, open-borders Republicans, precludes rigorous enforcement. The United States Attorney in Virginia refused to prosecute such cases in several Northern Virginia counties. The Democratic Party Commissioner of the Virginia Department of Elections refused to release any information on illegal alien registrations. Rep. Paul Ryan and Sen. Lindsey Graham deny the existence of voter fraud, but they offer no proof for their position. Then they ridicule President Trump when he asks to investigate the problem. In fact, numerous studies document the fraud that these politicians and their media votaries consciously ignore or derisively rebut. A well researched report on illegal alien voting in my home state of Virginia revealed more than a thousand illegal alien registrants in just eight counties. It did not include the two most populous, of which one, Fairfax County, is a de facto sanctuary county, and the very county described in the opening paragraphs of this article. Extrapolate those eight Virginia county totals to the whole state, and then to the entire United States, including states like California where no illegal alien controls exist, and you can see that President Trump's claims are not so frivolous. The effects of turning a blind eye to this felonious voter fraud? Virginia was once a solid red state. Once the illegal alien invasion hit the state in full flood after 2004, (thanks in part to Republican amnesty advocate George Bush's indifference to the tsunami) it became a blue state. The margin of Hillary Clinton's victory over Donald Trump in Virginia was almost entirely her margin in Fairfax County, where illegals have sanctuary and are protected by a solidly Democrat government. In five recent statewide elections, the Republican margin of defeat - Cuccinelli for Governor (vs. McAuliffe), Gillespie for Senate (vs. Warner), Allen for Senate (vs. Webb), and two Attorneys General - was almost certainly the result of illegal voting. Al Franken sits in the Senate almost certainly because of Minnesota vote fraud. Paul Ryan in his gerrymandered Wisconsin protectorate may not know that, but we citizens in Virginia and elsewhere do know it. Virginia has recently implemented some controls on voter fraud, such as a photo ID requirement. But that law has been weakened by liberal court challenges and a Democrat governor. What’s more, the ID law controls fraud only on election day. The real fraud is in the registration process. 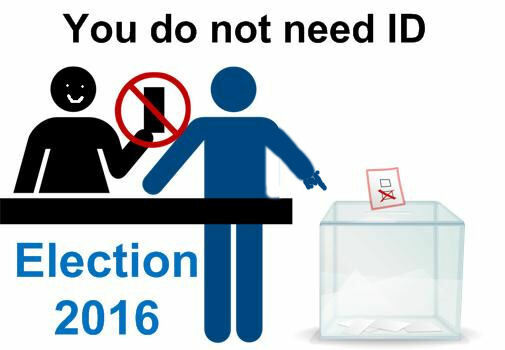 Once on the voter rolls, illegals are essentially home free, because even a photo ID is easy to come by. Analysts John Fund and Hans von Spakovsky, and TV reporter Eric Shawn, have done yeoman’s work in several published studies on voter fraud. A new study confirms similar voting fraud in Philadelphia, the electoral whale in Pennsylvania’s elections. As far back as 2012, a CBS 4/Miami Herald study, not exactly a right wing bastion, revealed that Florida’s voter rolls included as many as 180,000 non-citizen legal resident voters, while illegal alien voters weren’t even noted because they could not be explicitly identified. The left-leaning Pew Research Center in 2012 contended that state voter rolls contain millions of inaccuracies ripe for exploitation. There are numerous surveys in other states with similar results, should Ryan, Graham, Fox News, CNN and those of their ilk bother to study them instead of rail against Trump. Speaking of which, the Democratic (and Republican) politicians and pundits who now ridicule Trump as lacking evidence, are ignoring evidence which already exists. Trump has called their bluff, and there will now be the investigation they have sought. People in the real world already know the results. You can be sure that Democratic Secretaries of State and Democrat-controlled election boards are scurrying to seclude their files from prying eyes, and the federal and state bureaucracies who must supply the corroborating support data (jury duty exclusions, green card identities, tax records, visa overstays, border entry records, illegal alien arrests, drivers licenses, etc.) are finding ways to hide or retain the information. For many inside the chattering class Beltway bubble, illegal alien vote fraud is a debating exercise with the endgame political advantage. But for each and every citizen, it is a theft of that person's sacred vote. As with illegal alien crime, the compassion always goes to the perpetrator, not the victim. But my vote and your vote was secured and defended by thousands of servicemen over the years, many of whom gave their lives. It is sad and disgraceful to know that the value of a hard-won vote is being destroyed by people who shouldn't even be in this country. Bring on that investigation!